Yamaha P-45 - Is this keyboard wothy for your money? The Yamaha P-45 is a hot product in the world of keyboards. For good reason. Yamaha makes a lot of the best products on the market. Of course, that doesn’t mean that everything they make is perfect. Is this keyboard worth your time and money? Deciding this will require a good, honest Yamaha P-45 review. That is where we come into play. Testing keyboards is our job, and it is one that we take seriously. We have studied the ins and outs of this product. We have studied the ins an outs of this product in order to help you make an informed buying decision. 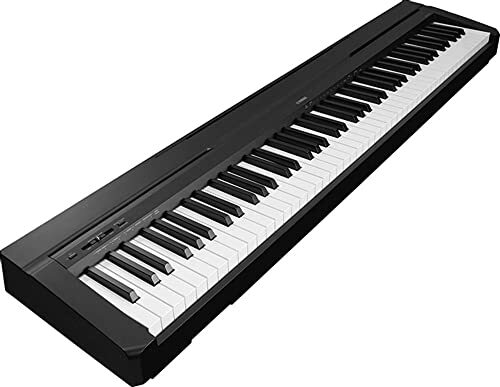 That in mind, read on for our Yamaha P-45 review. Let’s take a look at some key features so that you can make an informed buying decision. Read on! One of the first things that you will notice about this keyboard is that it comes with a really approachable price tag. Though not cheap in a general way, it is certainly affordable relative to the market. For a keyboard of this quality, you would generally expect to spend more money. However, it is worth mentioning that your money doesn’t buy you a lot. No stand, and no headphones. This is just the keyboard, and two pedals. The pedals are actually a pleasant surprise. Many keyboards in this price range don’t even include them, which is unfortunate as they are pretty necessary. If you do want a stand and headphones you are going to have to spend extra money to get them separately. If you don’t want to spend the extra money right away, you can get away with waiting for a while. The keyboard is sized to fit on most table tops. If you have a medium sized desk, or even a dining table, you will have a place to practice while you save up for a stand. You also get a really good keyboard with this product. This sounds like a basic feature but it isn’t always a given. Electric keyboards very often fail to capture the ideal feel of keys. This is especially true of products in this price range, that often come with unweighted keys. There is none of that here. The keys are fully weighted to ensure that it feels as realistic as possible. This is a big deal because it means that you won’t have any trouble transitioning into the world of acoustic playing. Even if you don’t intend to play an acoustic anytime soon, you should still have the ability to. Weighted keys ensure that this is the case. The user interface is also always worth considering. Keyboards can get pretty complicated. If your only objective is to have an affordable way to practice and learn the piano, then you want something simple. The Yamaha P-45 is really easy to use. The dashboard is really clean. No overly complicated nobs and sliders. You get a few simple buttons that make navigating features as simple as possible. The simple to use interface gives you the option to access any feature that you could want simply with the pressing of a few buttons. If all that you want is a simple piano that is as easy to use as possible, we get it. The interface of the Yamaha P-45 is going to be perfect for your needs. Last but not least, you also get the high-quality sound engineering that Yamaha is famous for. Yamaha captures the sound of one of their most prestigious grand pianos with this unit. Does the Yamaha P-45 actually sound like a grand piano? Of course not. Unfortunately, the only way to get true grand piano quality playing is to buy one. Short of that, you are going to need to be willing to spend a lot of money on a top tier digital piano. However, this isn’t to say that the sound of the Yamaha is shabby. You get plenty of quality for your money, and the piano really benefits from the source of its inspiration. Now, this said, the sound quality is not completely perfect. One issue that we found was that the quality really diminishes at higher-volumes. In other words, if you play loud, the sound quality is going to be distorted at higher-volumes. This is a pretty standard component of pianos in this price range. Still, the fact remains that the distortion is an issue that perfectionists will not care for. Playing with headphones, or an external speaker may help to alleviate this issue somewhat. However, these will, of course, need to be purchased separately, which will in turn ramp up the cost. All of this said, the sound-quality is better than you would expect from a keyboard in this price range. All things considered, there is lots to like about the sound quality of the P-45. You’ve learned what the Yamaha P-45 gets right. We have also taken a look at the product’s shortcomings. Now it is time to summarize these findings in an easy to read format. Read on for some pros and cons that will hopefully simplify your buying decision. So, what is it going to be? Is the Yamaha P-45 right for you? While we wouldn’t go so far as to tell you to buy this keyboard, we can give it our endorsement. Is it perfect? Unfortunately, no. No product is. However, we found that the cons were really pretty minimal. For the money, you get a great keyboard interface, and a high-quality sound that similarly priced products won’t match. 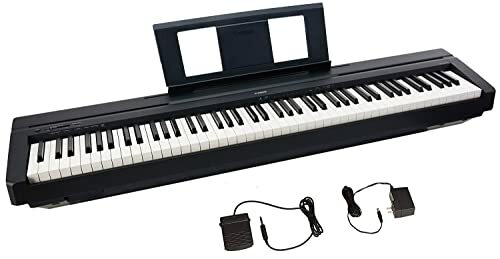 With a lack of any major cons, the Yamaha P-45 makes for a great buying opportunity for people looking for a moderately priced keyboard.